From designer Jonathan Aspinall at Yanko Design (and through Gizmodo), Link Mugs use interlocking protrusions and cutouts to, well... just look at the photo. 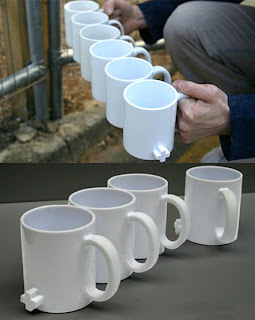 You can carry many many mugs as if by magic! Is it functional? Sure - it gets the job done when no tray is available. Is it usable? Yeah - it may take a few seconds to get the mug assembly together, but it sure looks doable. But what I want to concentrate on here is the "delight" factor. Being the recipient of a drink brought in this way would almost certainly bring a smile to one's face; and just maybe, the coffee would taste a little better. (Just like a new putter "works" better than a scratched one - the psychology of products is all around us!) Combine this with the previously posted Stain Stamp Mug design, and homes or restaurants can sneakily augment the moods of all their patrons. A good mood is a goal worth designing for!